This entry was posted on Saturday, October 11th, 2014 at 4:40 pm and is filed under Drama. You can follow any responses to this entry through the RSS 2.0 feed. You can leave a response, or trackback from your own site. I enjoyed it for all the reasons you mention. 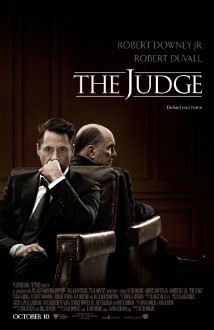 I was going to watch it anyway as I’m an unwavering Duvall, Downey and Thornton fan. By the way, your mention of the Willie Nelson performing a Coldplay tune did not go unnoticed. Musical soundtrack tunes have always been a significant part of my movie going and watching experience, ever since the Graduate. This movie’s characters self discovery process, that of Hank’s, was one I was hoping to see exactly as it unfolded as was the strong character of his father and how they both coped with the judge’s heart wrenching health deterioration. How he copes was simply inspiring. Ray, This movie has been the target of some pretty harsh commentary since it opened – some of it quite unfair, in my humble opinion. Knowing what a huge music fan you are, the two of us often share in that “extra” bit of enjoyment that comes from a well thought-out soundtrack or complementary score.